A regional daily parodied a classic series of film posters on its front page to reveal a new attraction coming to its patch. Monday’s edition of The News, Portsmouth, splashed on plans to build a Sherlock Holmes-themed tourist destination using the city’s Arthur Conan Doyle Collection, which features thousands of items celebrating the author’s fictional detective and his exploits. This year marks 130 years since the publication of the first Sherlock Holmes story, A Study in Scarlet, which was written in Portsmouth. The News’s report about the plans was accompanied by a spoof poster harking back to Basil Rathbone’s portrayal of Holmes in 14 films made between 1939 and 1946. A report by Stephen Baily, Portsmouth’s director of culture and city development, states: “Strategically the link between Sherlock Holmes and Portsmouth is very real, as the character was created during Conan Doyle’s time in the city. “We know that the collection is internationally a unique gem, and we need to initiate this new development to unlock the commercial potential of the collection. 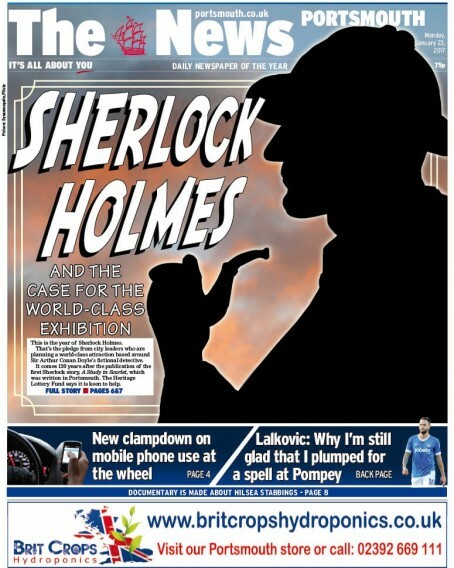 Mark Waldron, editor of The News, told HTFP: “The idea that Portsmouth should have a world-class Sherlock Holmes attraction has been around for a long time. But, 130 years since Arthur Conan Doyle published his first story on the great detective while a GP in the city, we are hoping that this will become a reality. “The fact the city council has identified a possible site, is looking for a development partner and – crucially – the Heritage Lottery Fund is keen is very exciting and we wanted to capture this on the front page. “The iconic silhouette of Holmes, a font with a nod to the classic Basil Rathbone film posters and a headline which could have come from Dr Watson’s casebook hopefully does the story justice and will have grabbed people’s attentions on the news stands. Must confess there is something I like about this, though it isn’t really news. Rather like the strapline. Well executed.